This game has been released by the website Dans La Musette and Marabout. 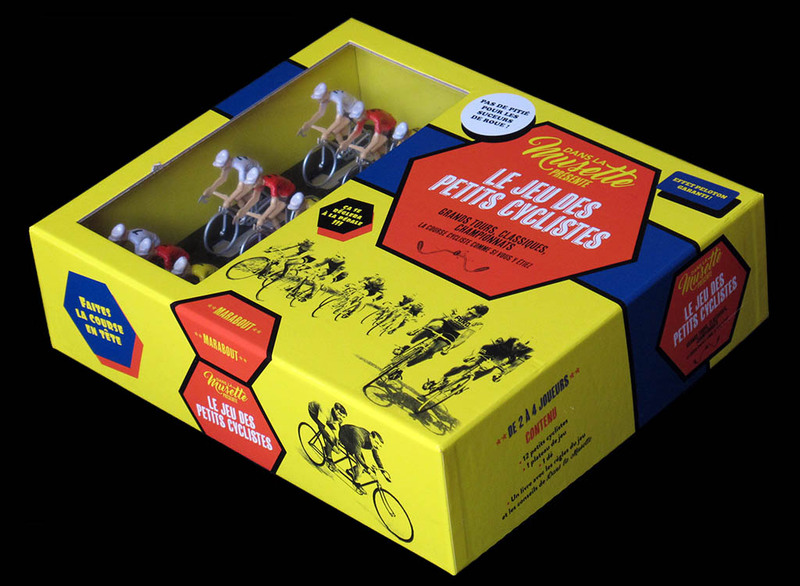 It is quite ambitious in its scope ("Grands Tours, Classiques, Championnats"), in its presentation with a nice box that allows to see the cyclists inside, and even in its rules ("effet peloton garanti"). The board measures 50 x 41 cms, has 44 squares, and may look like a track at first sight. Nevertheless, this is not a track-cycling game. 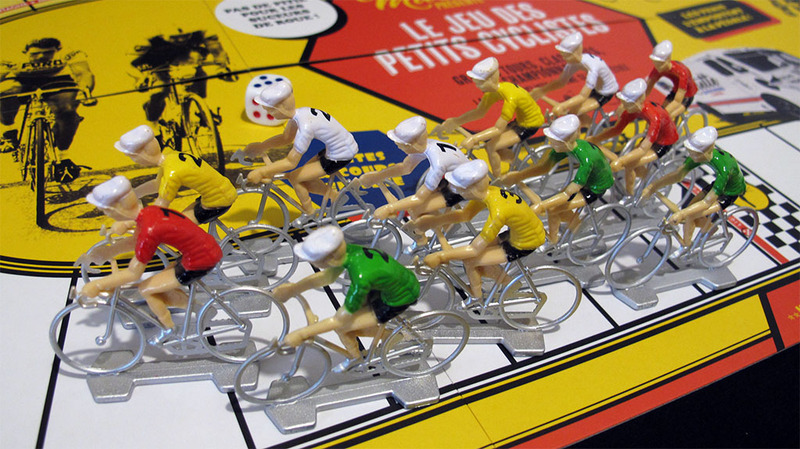 With this game you are supposed to be able to play the seasons greatest races ("Tour de France, Paris-Roubaix, World Championship..."). If you look closely at the board you can even see the mountains. This board, by the way, folds in six parts to fit the box which just measures 26 x 22 x 7.5 cms. The rules of the game also look quite decent at first sight. Each player manages a team of three riders. 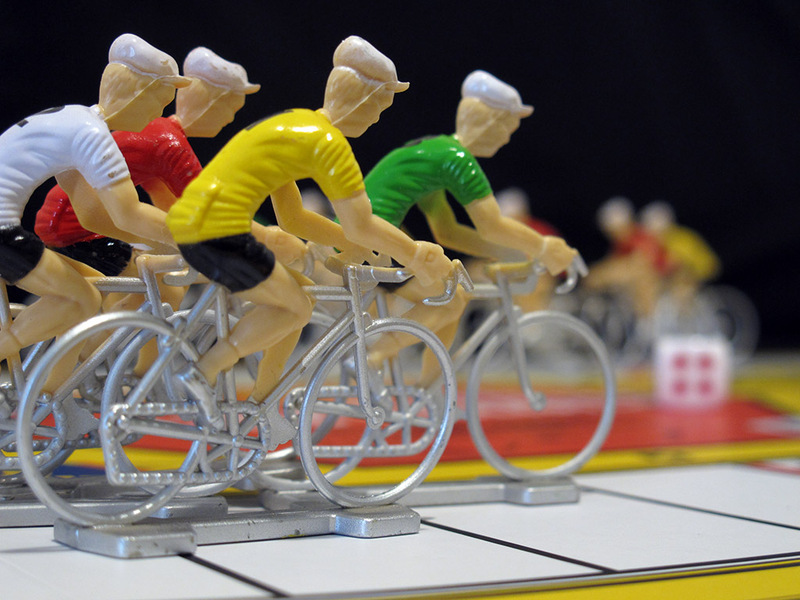 Although it is a dice game, players have different choices in their turn: they can either advance three squares, or follow the rider in front or beneath them, or throw the die and move accordingly. They have even an extra choice after having thrown the die: If the throw is six they can chose to move only 5 to let other riders follow. (This is an aspiration rule, of course). The rules for the mountain sections are a little different: the riders advance less in each move and do not move at all if they chose to throw the die and they happen to throw 4, 5 or 6. Furthermore, we have (simple) rules for time-keeping in stage races and even rules for time trial stages. So it looks like the game has everything it needs to be a reasonable choice as an uncoplicated cycling game, something to nice play with your kids. Unfortunately, all these rules and playing options do not necessarily make an interesting game. 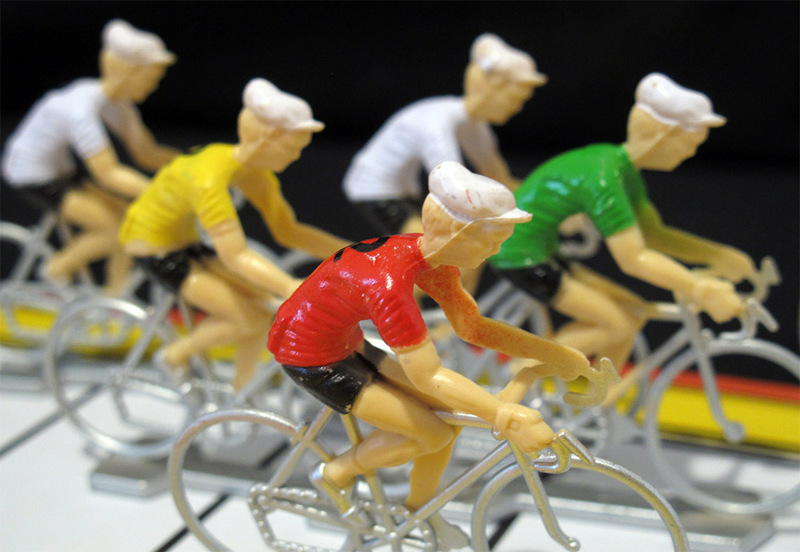 The aspiration rule, for instance, does not work so well as intended, since it is funnier to throw the dice and risk your luck than to follow sheepishly the peloton, and after all the game is simple enough to try to have fun. So, after all, I am afraid players will tend to throw the die in most cases and a supposedly half-strategic game might turn into a dice-throwing feast. A second problem is that the riders are slightly to big for the board. They are the modern type Cofalu cyclists measuring 58mm. The rules do not mention a maximum of riders in each square, and as you can see in the picture above, as long as the peloton remains packed the space is a problem. What is worse, Cofalu manufacturing standards have dropped and their figurines are not so stable as they used to be some years ago. So you have to be careful not to cause a mass fall when you move a cyclist. This said, the game is not so bad. 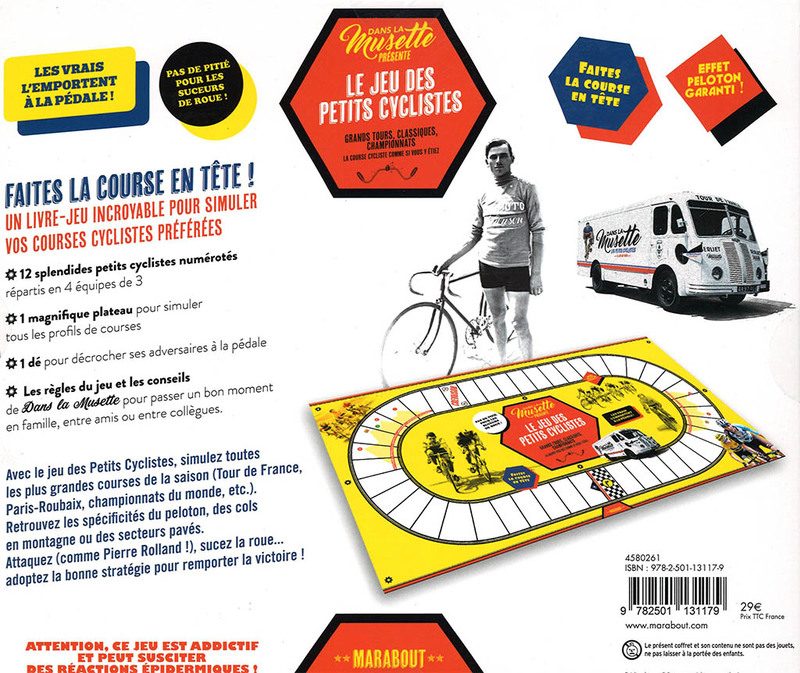 You can still have a nice evening playing with the kids as long as you are carefull not to make riders fall too often, the graphics on the box and board are quite nice, and the humourous playing advice at the end of the rules is very funny if your French is good enough to grasp it. 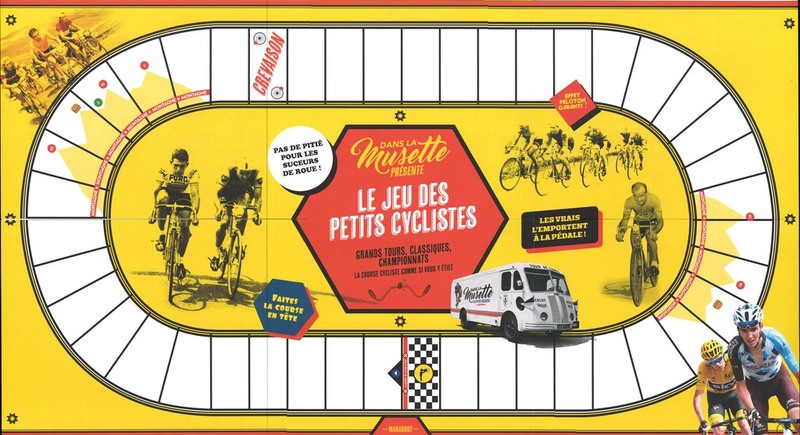 In fact, the booklet is probably the best of the game, but that is not so unexpected coming from the guys at Dans la Musette.